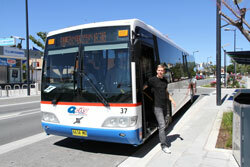 Using Qcity Transit services is simple. Follow these easy steps to ensure a safe and enjoyable journey. 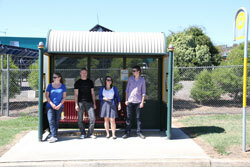 Bus stops are easy to find along each route - just look for the blue and yellow bus stop sign. Bus timetables list approximate times so it is a good idea to be at your stop a few minutes early to ensure you have time to get your money, Qcity Transit Smart Card or through ticket ready. 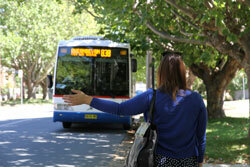 Drivers look for passengers standing at bus stops and look for a raised arm as a signal to pull over. If you are running for the bus or are not yet at the stop, the driver may not see you and you will have to wait for the next bus. 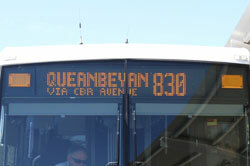 As the bus approaches, look for the route number and destination sign at the top of the front of the bus. If you are having trouble reading the sign, move towards the kerb and signal the driver. If it's not the bus you want, move back from the kerb so the driver knows you do not need them to stop. Please signal the driver clearly and as early as possible by raising your arm. This will give the driver time to safely pull over. 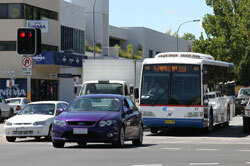 Please note: If you do not signal the driver, the bus may pass and you will have to wait for the next bus. If you signal late, the driver may not be able to pull over safely and you may have to wait for the next bus. Check the direction of travel on your timetable. If you are not sure where to stand, call Traveller Info on 6299 3722 and our customer service staff will help you find the right place. The bus will come to a complete stop before opening its doors. Wait for all departing passengers to exit the bus, and then enter the bus, keeping to the left hand side. 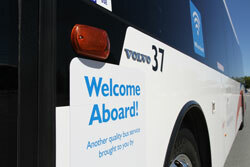 You may pay a cash fare to the driver, use your Qcity Transit Smart Card or show your through ticket. Press the bell before your stop so the driver has plenty of time to pull over. Check to make sure you have all your belongings. Wait for the bus to come to a complete stop. Don't step off the kerb until after the bus has gone. Other drivers cannot see you if you walk in front of the bus. The rule is "When the bus is gone, that's when you cross". Don't worry. Press the bell for the next stop. When the bus stops tell the driver your problem and they will assist you to find the correct bus.